Massachusetts General Hospital’s commitment to members of the U.S. military began just before the Civil War. In a statement to Massachusetts Governor John Albion Andrew (1818-1867), hospital trustees “assure the Executive of the Commonwealth that, in the event of any diseased or wounded soldiers being returned to this city, they shall consider it their duty and privilege to extend to them all the succor and relief that may be within their power." Later in the 19th century, the Spanish-American War (the War of 1898) became “the first to which MGH sent a unit of physicians and nurses.” They served on the hospital ship Bay State. In the early 20th century, even before the U.S. entered World War I (1917), MGH physicians and nurses who had graduated from the MGH Training School for Nurses (later named the School of Nursing) had begun to serve, most at Base Hospital #6 in Talence, a suburb of Bordeaux, France. During World War II, Base Hospital No. 6 was reactivated as the 6th General Hospital and was staffed by many MGH physicians and nurses. Some MGH nurses served in Korea and Vietnam, as did some MGH physicians. In 2009, MGH and the Red Sox Foundation instituted the Home Base program, dedicated to healing the invisible wounds of post-9/11 veterans, service members and their families. Cromelien, M. Red Cross work at Chickamauga Park. Quarterly Record of the Massachusetts General Hospital Nurses Alumnae Association. 1914 Sep; 4(3): 6-11. Myers, GW. Spanish-American War. IN: History of the Massachusetts General Hospital, 1872-1900. Boston: Griffith-Stillings Press, . Parsons, SE. War Service. IN: History of the Massachusetts General Hospital Training School for Nurses. Boston : Whitcomb & Barrows, 1922. Carrie Hall: MGH SON graduate makes her mark during WW I. Caring Headlines 2017 Sep 7; 6. Chambers JA, Ray PD. Achieving growth and excellence in medicine: the case history of armed conflict and modern reconstructive surgery. Ann Plast Surg. 2009 Nov;63(5):473-8. doi: 10.1097/SAP.0b013e3181bc327a. PubMed PMID: 20431512. Helen Dore Boylston: A closer look at an MGH nurse during World War I. Caring Headlines 2017 Aug 3; 6. The History of U.S. Army Base Hospital No. 6 and its part in the American Expeditionary Forces, 1917-1918 [Contact MGH Archives for use]; introduction by Henry Alden Shaw. Boston: Massachusetts General Hospital, 1924. The Hospital in the World War. IN: Memorial & Historical Volume, Together with the Proceedings of the Centennial of the Opening of the Hospital. Boston: Griffith-Stillings Press, 1921. MGH nurses serve in WWI before they have right to vote. Caring Headlines 2017 May 4; 4. MGH nurses volunteer to serve in First World War. Caring Headlines 2017 Apr 6; 6. Myers GW. War Bibliography. Bull Med Libr Assoc. 1917 Oct;7(2):25-7. PMID: 16015838. [Myers GW]. War Bibliography : Treadwell Library, Massachusetts General Hospital, Boston, Mass. Boston, Mass: [n.p. ], [1918?]. Nurses describe conditions while serving overseas during the Great War. Caring Headlines 2017 Oct 5; 8. Over there. Caring Headlines 2017 Nov 2; 10. Parsons, SE War Service, Continued. IN: History of the Massachusetts General Hospital Training School for Nurses. Boston : Whitcomb & Barrows, 1922. Quarterly Record of the Massachusetts General Hospital Nurses Alumnae Association, 1914-1916. Quarterly Record of the Massachusetts General Hospital Nurses Alumnae Association, 1917-1919. The spirit of devotion: MGH in World War I. MGH Hotline, 2017 Jul 7. Washburn, FA. The Hospital in the World War. IN: The Massachusetts General Hospital; its Development, 1900-1935 [Contact MGH Archives for use]. Boston, Houghton Mifflin Company, 1939. Beecher HK. Anesthesia for Men Wounded in Battle. IN: U.S. Army Medical Department, Office of Medical History. United States Army in World War II, 2009. Ferguson CM. Who was Robert Hurlbut? Bull Am Coll Surg. 2006 May;91(5):46-51. PubMed PMID: 18557050. Nevarez MD, Yee HM, Waldinger RJ. 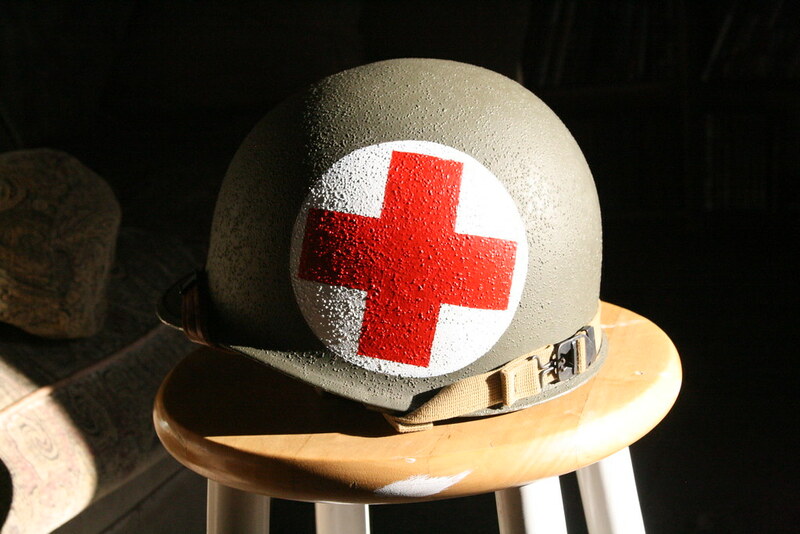 Friendship in War: Camaraderie and Prevention of Posttraumatic Stress Disorder Prevention. J Trauma Stress. 2017 Oct;30(5):512-520. doi: 10.1002/jts.22224. Epub 2017 Oct 12. PubMed PMID: 29023929; PubMed Central PMCID: PMC5659877. Nevarez MD, Malone JC, Rentz DM, Waldinger RJ. War and remembrance: Combat exposure in young adulthood and memory function sixty years later. Compr Psychiatry. 2017 Jan;72:97-105. doi: 10.1016/j.comppsych.2016.10.003. Epub 2016 Oct 7. PubMed PMID: 27776275; PubMed Central PMCID: PMC5124502. Quarterly Record of the Massachusetts General Hospital Nurses Alumnae Association, 1939-1942. Quarterly Record of the Massachusetts General Hospital Nurses Alumnae Association, 1943-1945. Rae RG. The 6th General Hospital (Massachusetts General Hospital Unit). Am J Orthod Oral Surg. 1946 Oct;32(Oral Surg):600-4. PubMed PMID: 20998748. Sturgis SH, Holland DJ Jr. Observations on 200 jaw fracture cases admitted to the 6th General Hospital. Am J Orthod Oral Surg. 1946 Oct;32(Oral Surg):605-34.PubMed PMID: 20998749. Washburn FA. Presentation of national colors to General Hospital No. 6, United States Army by Veteran Base Hospital No. 6 at the Massachusetts General Hospital, May 4, 1942. Harv Med Alumni Bull. 1942 Jun; 16(4): 79-81. Panel Presentation: MGH Graduate Nurses Who Served in the Military During the Viet Nam War. (Five DVDs created during MGH School of Nursing Homecoming, 2015). [Contact MGH Archives for use]. Parrish, JA. Autopsy of war : a personal history. New York: Thomas Dunne Books, 2012. Pitman RK. Combat effects on mental health: the more things change, the more they remain the same. Arch Gen Psychiatry. 2006 Feb;63(2):127-8. PubMed PMID: 16461853. Chang JC, Holloway BC, Zamisch M, Hepburn MJ, Ling GS. ResQFoam for the Treatment of Non-Compressible Hemorrhage on the Front Line. Mil Med. 2015 Sep;180(9):932-3. PubMed PMID: 26327542. Goetter EM, Bui E, Ojserkis RA, Zakarian RJ, Brendel RW, Simon NM. A Systematic Review of Dropout From Psychotherapy for Posttraumatic Stress Disorder Among Iraq and Afghanistan Combat Veterans. J Trauma Stress. 2015 Oct;28(5):401-9. Erratum in: J Trauma Stress. 2015 Dec;28(6):590. PubMed PMID: 26375387. King DR. Thirty consecutive uses of a hemostatic bandage at a US Army combat support hospital and forward surgical team in Operation Iraqi Freedom. J Trauma. 2011 Dec;71(6):1775-8. PubMed PMID: 22182888. Ohye B, Kelly H, Chen Y, Zakarian RJ, Simon NM, Bui E. Staying Strong With Schools: A Civilian School-Based Intervention to Promote Resilience for Military-Connected Children. Mil Med. 2016 Aug;181(8):872-7. PubMed PMID: 27483526. Ohye B, Roizner M, Laifer L, Yang C, Bui E. Training clinicians to provide culturally competent treatment to military-connected children: A collaborative model between the Massachusetts Society for the Prevention of Cruelty to Children and the Red Sox Foundation and Massachusetts General Hospital Home Base Program. Prof Psychol Res Pr. 2017 Jun;48(3):149-55.